Malaysian Prime Minister Datuk Seri Najib Razak told a press conference March 15 that the search for the missing Malaysian Airlines flight MH370 has now been extended from the border Kazakhstan and Turkmenistan to the south of the Indian Ocean, and no more in the South China Sea. As of now, 14 countries, 43 ships and 58 aircraft are involved in the search for the missing plane, whose last contact was 8.11am on March 8. It is one of the biggest hunts ever – involving dozens of ships, planes across vast oceans and thousands of people on the Internet searching real-time satellite pictures – but Malaysia Airlines Flight MH370 is still lost. 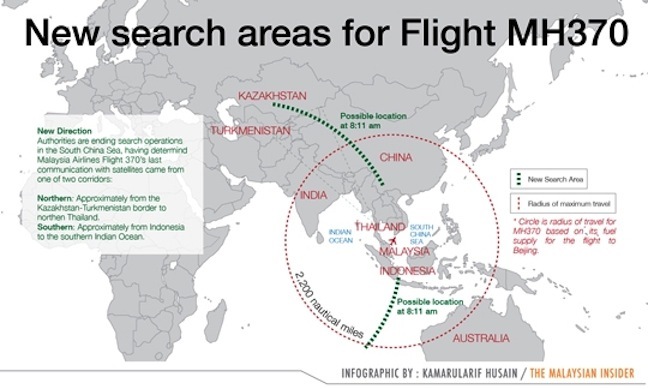 The Boeing 777-200ER carrying 239 people vanished exactly a week ago, while on an overnight flight to Beijing but a search that began in the South China Sea and slowly expanded westwards to the Indian Ocean has come to nought so far. There is no debris field anywhere on sea or land on either seas. There is no sign of the wide-body jet with the registration number 9M-MRO on the ocean floor, or perhaps parked at one of the 634 runways within its fuel capacity. Malaysian Prime Minister Datuk Seri Najib Razak spoke to families and media on March 15 with no news about the plane’s fate or location, except to say that the search has now extended from the border of Kazakhstan and Turkmenistan to the Indian Ocean, and no more in the South China Sea. As of now, 14 countries, 43 ships and 58 aircraft are involved in the search for the missing plane, whose last contact was 8.11 am on Saturday (March 8). Earlier, a Malaysian government official said investigators had concluded that one of the pilots or someone else with flying experience hijacked the missing flight MH370. Associated Press quoted the unnamed official involved in the investigation as saying that the hijacking was no longer a theory but “conclusive.” But Najib stopped short of saying that. In the light of Najib’s latest disclosures, the following is what is known and not known about Flight MH370, already called an “unprecedented aviation mystery”. * The current location of Flight MH370. It disappeared somewhere north of the Strait of Malacca after its last ping at 8.11am, March 8, 2014. * The condition of all its 227 passengers and 12 crew members. * The person or persons flying MH370 after it vanished from radar screens. * The person who switched off the plane’s communication links at 1.07am and transponders at 1.21am last Saturday (March 8). * The motive for its disappearance. It still remains a matter for conjecture. * Whether it is north or south of the Strait of Malacca. The search and rescue mission is now focused on a northern corridor extending from Thailand to Kazakhstan/Turkmenistan and the southern corridor extending from Indonesia to the south of the Indian Ocean. * It isn’t in the South China Sea. The search has been called off there despite various discoveries from debris, oil slick to seismic events. * The plane crossed the Malay peninsula at the border with Thailand and was considered as friendly, and therefore not challenged. * There were two Iranians travelling on Italian and Austrian passports stolen from Thailand over the past two years. * One man had a Chinese passport with the same number as a Chinese man who never left his Fujian province in China. * There were Chinese calligraphers, government servants, holidaying couples, two infants and 20 Freescale electronics plant officials and workers on board the plane. * It was a code-share fight with China Southern Airlines. The two men travelling on stolen passports had tickets bought together from a travel agent in Pattaya, Thailand, a day before the flight. * The plane’s disappearance has brought attention to rings specialising in stealing and selling stolen passports out of Thailand. * The pilot is 53-years-old with more than 18,000 hours flying time and has built a B777 flight simulator at home. His house was raided today. * The co-pilot is 27-years-old with 2,700 hours flying time and who has apparently taken female passengers to the cockpit while flying. * Malaysia Airlines is one of the world’s safest air carriers after Qantas and Singapore Airlines. It has only had two accidents in the past – one was a hijacking. – March 15, 2014. This article first appeared in The Malaysian Insider, a news portal.